Fundraising events can be like rollercoasters – never sure what will happen next! No matter how prepared nonprofits are or the countless hours of advanced planning, unforeseen twists arise at every fundraiser. When the best laid plans are challenged, nonprofits need a partner and solution that adapts quickly to onsite needs. Flexible tools and expertise at charity auctions and events, can be the difference between a positive donor experience and disaster. This is the story of Cristo Rey New York High School, and how quick thinking and innovative use of technology made the all difference onsite! Cristo Rey New York High School has been a OneCause (formerly BidPal) customer since 2011. They were an early adopter of mobile bidding in New York City; over the 7-year partnership, they have used OneCause mobile bidding to reach more donors and raise more funds. Their Annual Gala, held every spring, is a prime source of fundraising revenue and important part of their donor relationship building. What happens when mother nature puts expert fundraisers on a rollercoaster the night of their event? 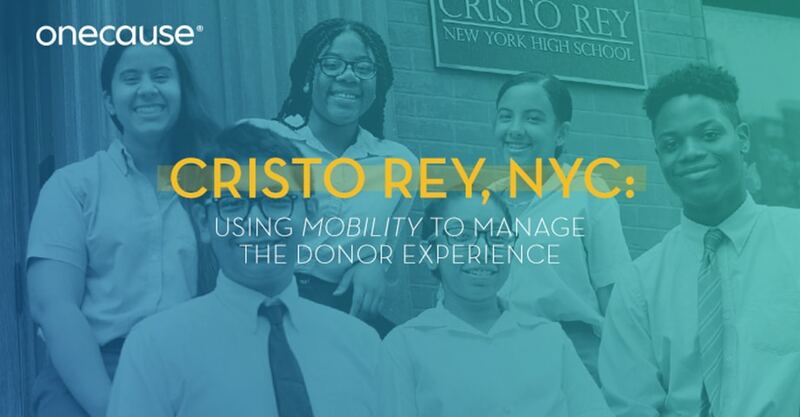 The Cristo Rey team brainstormed with their OneCause Event Manager and came up with a plan to speed up the lines and get donors into the auction. Enter OneCause SmartPay Anywhere registration and checkout software. The software is part of every OneCause mobile bidding and online fundraising subscription. The easy-to-use iPad enabled software helps nonprofits to run mobile registration – no bulky or cabled laptops to worry about. Full mobility to run your registration anywhere at any time! “We started grabbing people at coat-check and registering them on the go, before they even got to the registration tables. With the iPads, it was so easy! Volunteers could move around the crowd and get guests in the system so quickly,” said Solberg. In short order, the Cristo Rey and OneCause team got registration lines moving and ensured a seamless experience as soon as guests walked in the door. With a new flow established, the team went on to execute another successful fundraiser! “I loved the iPads, my experience with another mobile bidding company was laptop based. The OneCause iPads gave us the flexibility we needed to move and register guests where they were,” said Sollberg. Another year of collaborative partnership, problem solving and solutions designed to ensure guests are in the mood to fundraise. Cristo Rey New York High School is a 501(c)3 located in New York City. For more information on their mission, fundraising and student body, visit https://www.cristoreyny.org/.